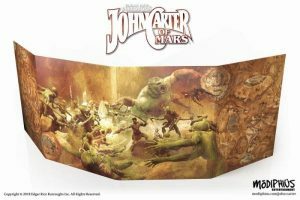 Modiphius Entertainment is delighted to be announcing a slew of content releases over the next few weeks in celebration of our John Carter of Mars Month as this fantastic range hits retail stores. 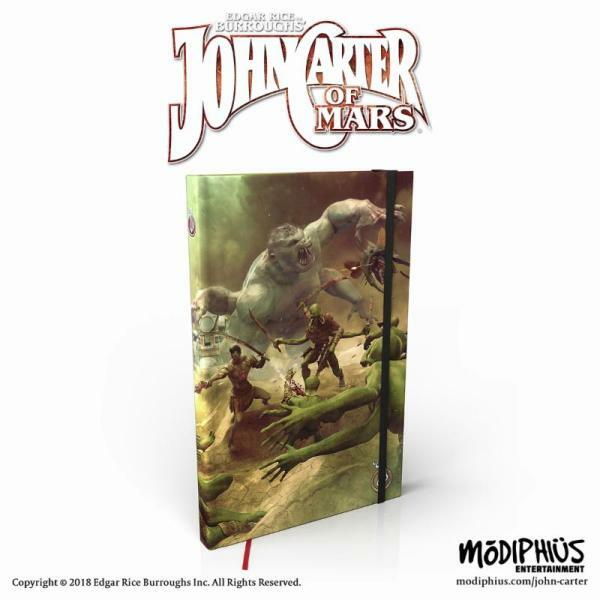 John Carter of Mars is a pulp action adventure roleplaying game using a streamlined version of the 2d20 system and set across the wondrous and dangerous world of Barsoom. 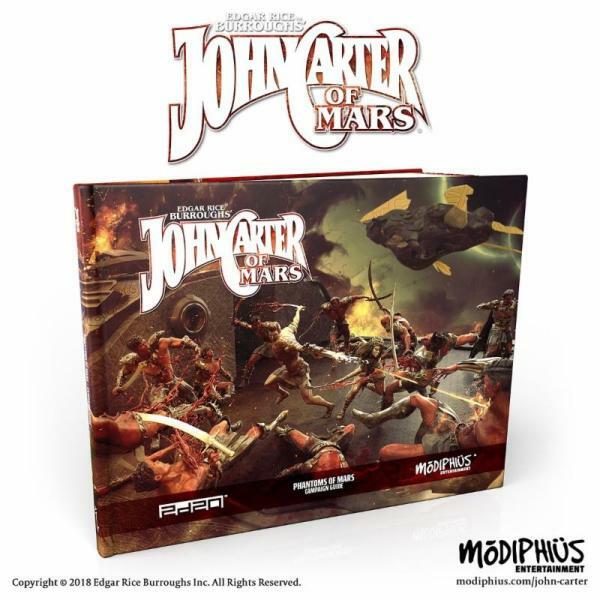 The highlight of our releases next week is a live play video of John Carter of Mars being played from Modiphius HQ with our fabulous GM Virginia at the helm. You can view this on Facebook Live (https://www.facebook.com/Modiphius/) on Wednesday the 17th of April from 3 PM BST. Beyond the livestream you can look forward to a wide range of John Carter content releases from Modiphius Entertainment to support the retail release. Two of the designers behind John Carter of Mars, Jack Norris (Tianxia: Blood, Skill, and Jade, Fantasy AGE, Marvel Heroic Roleplaying) and our in-house designer Benn Gray (Mutant Chronicles, Infinity and Conan) will be writing about their experience of designing John Carter of Mars at www.modiphius.com/john-carter alongside a series of development diaries which will offer you a behind the scenes look at the making of John Carter of Mars. Expect to see some of the fabulously detailed art from the core John Carter of Mars box in a series of flip through videos. Katya Thomas is our in-house art director for John Carter of Mars and has a diverse team of artists all over the world contributing to the beautiful imagery within the John Carter of Mars books including Bjorn Barends (cover art), Cristi Picu, Daren Bader, Giorgio Baroni, Jeff Porter, Michele Giorgio, Mitchel Malloy, Paolo Puggioni, Rodrigo Toledo, Rolf Mohr, Soren Meding, Steve Stark, Thomas Denmark and Toma Feizo Gas. For those interested in running John Carter of Mars adventures we will be releasing a video tutorial on how you can use the John Carter of Mars Narrators Toolkit which is an all in one package of both GM screen and narrators guide which will equip you with everything you need to generate and tell action packed pulp adventure stories in the land of Barsoom. 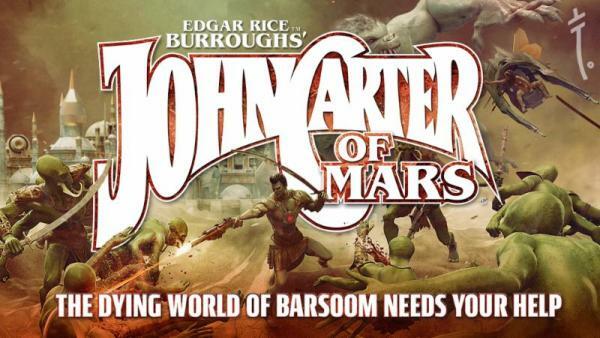 If you want to learn more on how to play as an adventurer in the land of Barsoom we are releasing a tutorial video on how you can best use the yet to be released John Carter of Mars Players Toolkit to build and role play your characters. 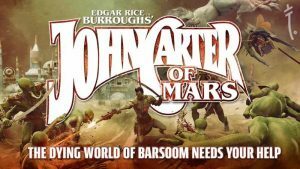 To get a feel for what John Carter of Mars: Adventures on the Dying World of Barsoom! 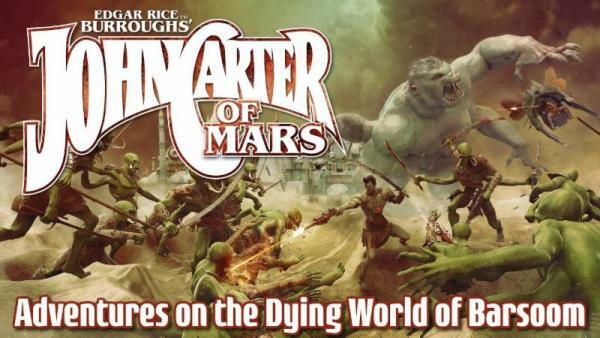 is about check out this trailer for the John Carter of Mars Roleplaying Game. Virginia is Publishing Assistant here at Modiphius and will be running a game of John Carter of Mars on Facebook live at Modiphius HQ from 3 PM BST on Wednesday the 17th of April. 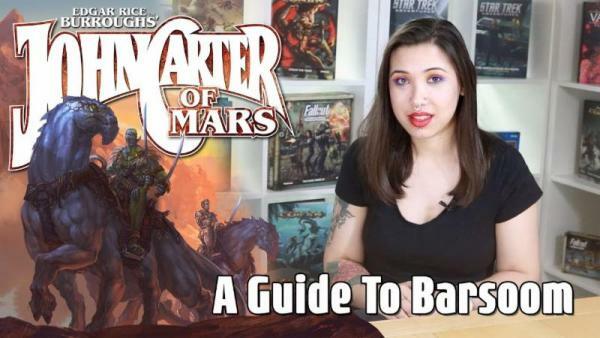 and she’ll take you through all the races of Barsoom, as well as the cultures and traditions of the planet, so that you can get some ideas about what you want to feature in your own game of John Carter of Mars: Adventures on the Dying World of Barsoom! 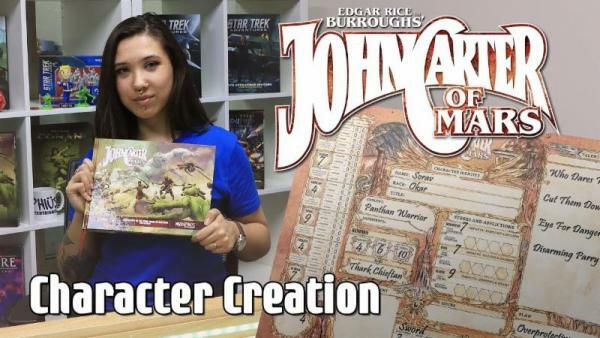 In this video Virginia is going to take you through a step-by-step process for creating your own characters for use in John Carter of Mars: Adventures on the Dying World of Barsoom! Find out how easy it is to create a character for the John Carter of Mars RPG. 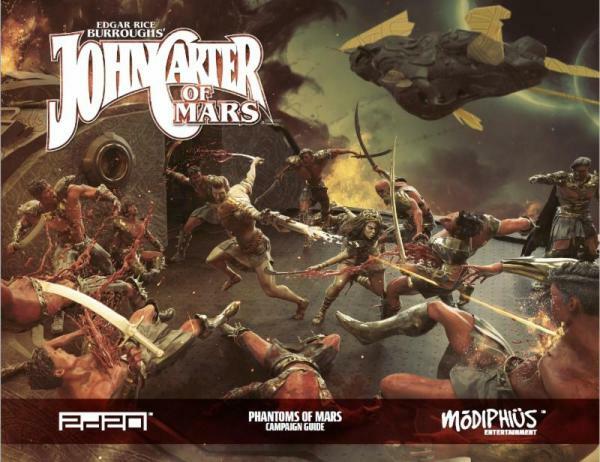 Take a closer look below at our detailed John Carter of Mars product line. Edgar Rice Burrough’s John Carter of Mars: Adventures on the Dying World of Barsoom transports you to the Red Planet of Barsoom, an arid, dying land of ancient civilizations and fearsome creatures. Begin your adventures of romance and heroism using a pulp-action inspired variant of the 2d20 System. Take on the role of heroes as you travel, battle, and romance your way across the wondrous and dangerous world of Barsoom. Play as John Carter, Princess Dejah Thoris, the fearsome Thark warrior Tars Tarkas – or create your own heroes from an exciting variety of options. An overview of Barsoom and its peoples, perfect to introduce new players to the wondrous world of John Carter of Mars. Detailed chapters on Barsoomian technology, creatures and cultures. A new talent focused, narrative variation of the 2d20 System including a step-by-step character generation system designed to create heroes from a variety of backgrounds and concepts. Create a wide variety of characters such as a Dashing Red Martian Duelist, a Brilliant First Born Scientist, a Savage Beastmaster, a Courageous Airship Officer, even Earthborn characters, so players can follow in the bounding footsteps of John Carter himself! A detailed narrator’s section filled with information on how to run genre-and-setting appropriate campaigns, including information about the great and terrible secrets of Barsoom. Three eras of play based on the adventures of John Carter himself. Adventure during the Dotar Sojat era, or adventure during the time where Carter became a Prince of Helium and in the years after when he was believed dead, or fight alongside Carter and his allies during the later Jeddak of Jeddaks era. An introductory adventure, the Mind Merchants of Mars, to get players and narrators started on their adventures and immersed in the world of Barsoom. Uncover the nefarious conspiracy of the mysterious organisation known as the Eidolon as you adventure your way across Barsoom to save the people of the dying planet. Phantoms of Mars will take your heroes on a journey full of pulp-action, intrigue and heroism as they race to uncover the Eidolon conspiracy and see just how far it has spread. A 128 page, full colour, landscape hardback book with a complete campaign arc for the John Carter of Mars role-playing game. Detailed narrator’s section with information on key characters, plots and advice on how to run and insert the campaign into existing games. Also includes the Swords of Mars 2d20 Skirmish rules for use with the John Carter of Mars miniature collection. Modiphius Entertainment presents the John Carter of Mars Narrator’s Toolkit. The Toolkit includes the official John Carter of Mars narrator screen. The exterior features amazing rendered artwork from the cover of the core rule-book, while the interior features useful rules, tables and charts for narrators. Also included is a booklet with new advice on running campaigns as well as new rules. Full colour, 4-panel narrator screen with artwork on the exterior and reference tables and charts on the interior. 36 page, full colour booklet with advice on running and creating campaigns as well as new additional rules for travel and large-scale combat. Modiphius Entertainment presents the John Carter of Mars Prince of Helium Notebook. The exterior features amazing rendered artwork from the cover of the core rulebook, while the interior features blank, lined and gridded paper to detail your journey across Barsoom as well as character sheets to keep your heroes’ information all in one place. Fully illustrated cover with elastic closure. 160 page notebook featuring blank, lined and gridded paper. Character sheets built into the notebook for ease of use in play. We also have a selection of individual miniatures including John Carter and Dejah Thoris in alternative poses, Sola, Ras Tharvas and Gor Hajus, plus monsters of Mars like the White Ape, Apt and Banth, as well as Plant Men and Synthetic Men. These join the recent John Carter Collector’s Slipcase set, miniature sets featuring the Heroes of Barsoom, Helium and Zodanga Fighting Crews and Thark Warband, plus Helium, Thark and Zodangan dice sets, which are all available as part of the John Carter of Mars Collection on Modiphius.net. You can also buy all the PDFs as part of the John Carter Collection on DriveThruRPG.com. and remember these gorgeous Slipcase and hardback books, Narrators Screen, Dice sets and Notebook are all now available in your friendly local gaming store. Modiphius Entertainment is a London, England-based entertainment publisher of tabletop games and related hobby merchandise. The company launched its first game, the Achtung! Cthulhu Roleplaying Game, in 2013, followed by the Mutant Chronicles RPG, DUST Adventures RPG based on Paolo Parente’s DUST universe, Infinity The Roleplaying Game based on the best-selling miniatures game, Conan, Adventures in Age Undreamed of, the official roleplaying game of Robert E Howard’s barbaric universe, Matt Leacock’s Thunderbirds, a cooperative board game based on the classic 60’s show and the official Kung Fu Panda Boardgame. Modiphius Entertainment seeks to inspire with its tales of heroism, adventure and courage. Modiphius also works to combat global child trafficking through raising awareness of and funds for Vision Rescue. For more information, please visit www.modiphius.com.